Welcome to Stempelglede's Design Team Blog! Salg! 50-80% avslag på alt som er på lager! All images text, and content on this site © Stempelglede, unless otherwise stated. Reproduction without written consent is strictly prohibited. Alt innhold på dette nettstedet er beskyttet i følge Åndsverkloven og kan ikke kopieres eller brukes uten særskilt avtale med Stempelglede. Etter en lang pause fra kortlaging er jeg endelig tilbake. Jeg har den siste tiden laget flere kort med motiv fra Stempelglede. Dette kortet har motiv fra platen Vintage garden. Jeg har som vanlig malt med distress ink på akvarellark. Motivet er pyntet med glitterlim. Her er et bursdagskort jeg har laget med et av favorittstemplene mine. Motivet er fra platen vintage garden. Dette er det stempelet i samlingen min jeg har brukt mest. Stempelmotivet passer til de fleste anledninger. Jeg har malt med distress ink på akvarellark. Motivet er også pyntet med glitterlim. Kortet er pyntet med blomster, perler og en selvlaget sommerfugl. I slutten av sist uke fikk jeg spørsmål om jeg kunne lage et bursdagskort til en 70 åring. Hovedmotivet på kortet er fra stempelplaten Vintage garden. Motivet er fargelagt med distress ink. Deretter har jeg brukt glitterlim på deler av motivet. Mønsterarkene er fra Maja Design. 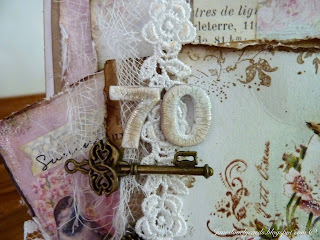 Tallet 70 er laget med dies fra Tim Holtz. Tallene har fått et lag med crackle accent før jeg limte de på kortet. Good morning! Today I'd like to share a 70th birthday card using the gorgeous bird stamp from the Vintage Garden stamp set. The scroll stamping around the edge of the image was done with a scroll stamp from the same set. 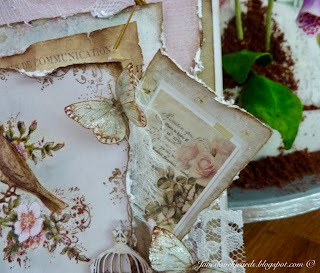 I painted the image with Distress Inks and used a white gel pen to add some details to the flower centres. I also added a dot of Glossy Accents to the eye. 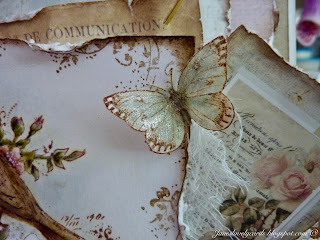 The smaller butterfly is from the Vintage Baby stamp set, stamped onto coffee filter paper, painted with Distress Ink and a white gel pen and then covered in Wink of Stella pen. The larger butterfly is from the Post Card from Paris stamp set, painted in the same way as the smaller butterfly. 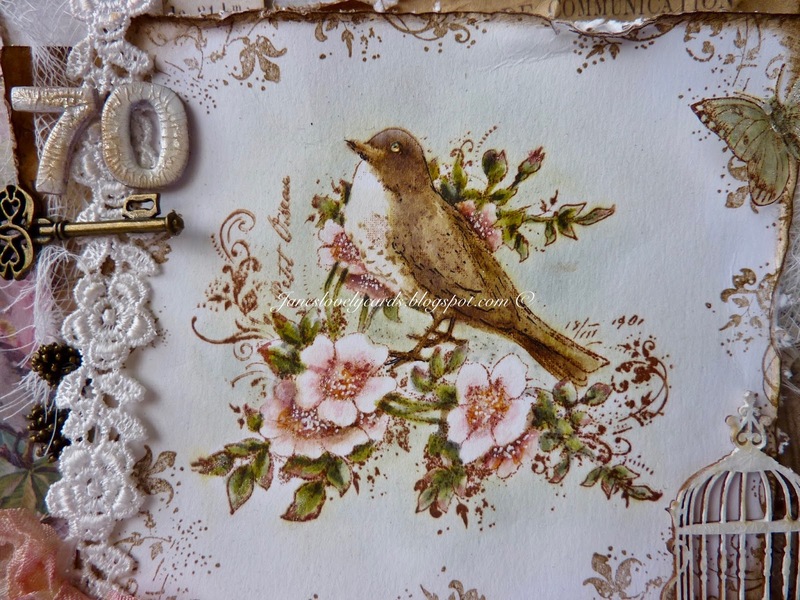 The sweet bird cage is a chipboard piece which I have painted with white paint, inked the edges with Walnut Stain Distress Ink and then coated with Crackle Accents. I coloured the seam binding with Victorian Velvet Distress Ink to match the papers and scrunched it up to dry. The numbers are also chipboard pieces treated in the same way as the bird cage. The key is from my stash. I have added several layers beneath the image to add texture to the card. The ticket with the bird on was cut from a paper sheet I've had lying around for a while now. The ticket with the rose on is from the same paper. I dag vil jeg vise dere et posekort jeg har laget til en konfirmant. På kortet har jeg stanset ut en bunad som selve motivet, og til "brodering" på bunaden har jeg brukt noen swirl stempler som jeg har embosset i hvitt. Good morning! I have another Stempelglede Christmas card to share with you today, this time using the bird stamp from the Vintage Garden stamp set. If you're thinking that this card seems familiar it is almost an exact copy of this one I made a couple of years ago. 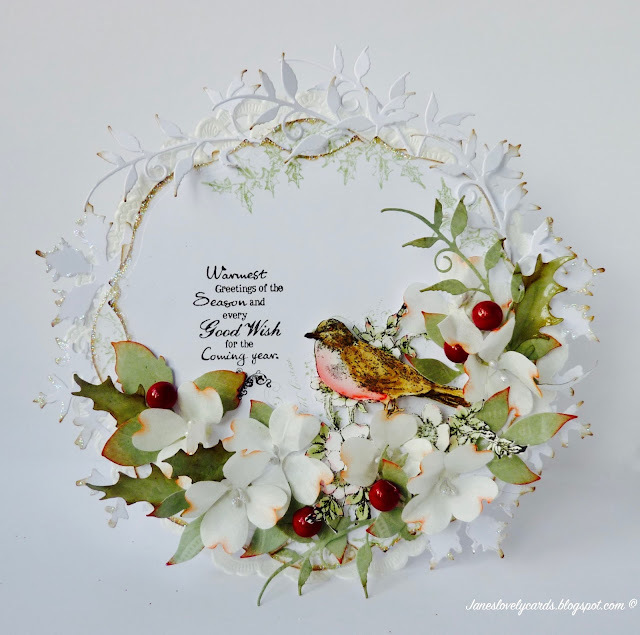 This time I have used a Christmas sentiment, holly leaves, berries and a snowflake edge instead of butterflies. 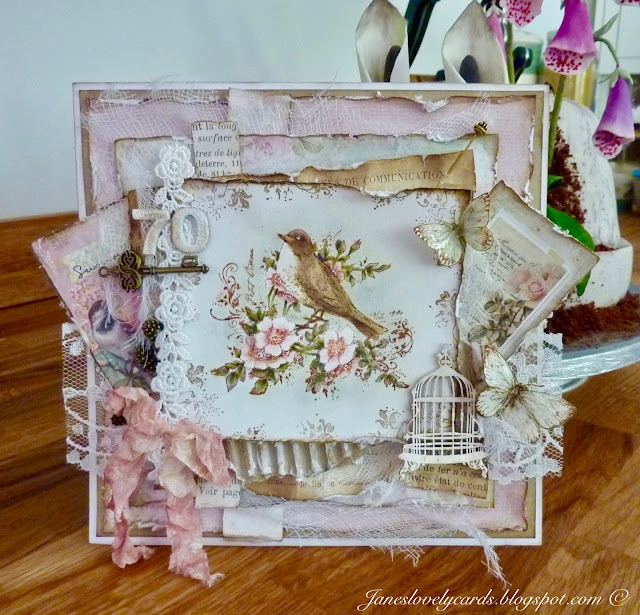 I have painted the bird stamp three times using Distress Inks and then cut different parts out to paper tole the bird for a 3D effect. I have also added Glossy Accents to the bird's eye and beak to make them look more realistic. 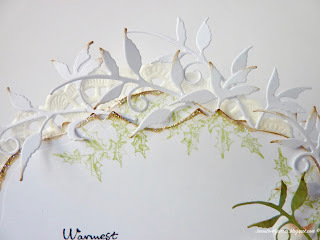 I have used several different leaf dies to create leaves from green paper and white cardstock. They have all been edged with Walnut Stain Distress Ink. 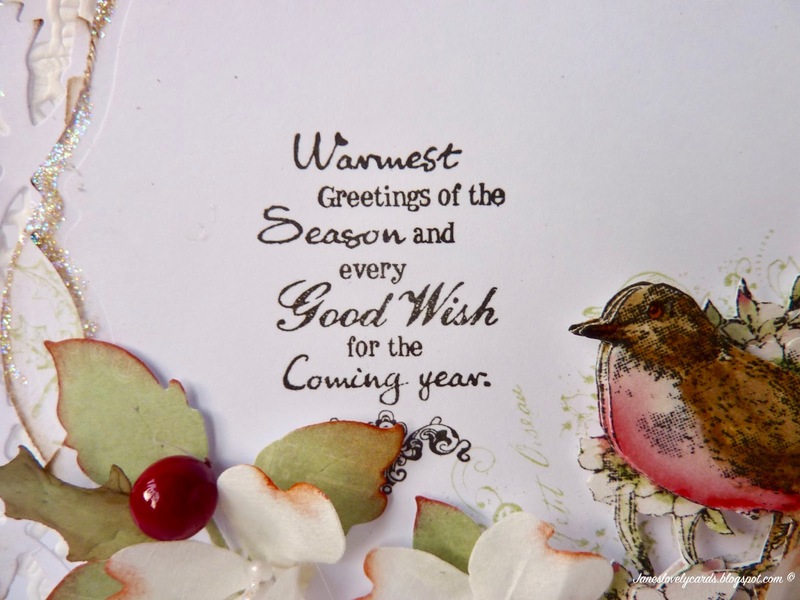 The sentiment is from the Vintage Christmas stamp set. 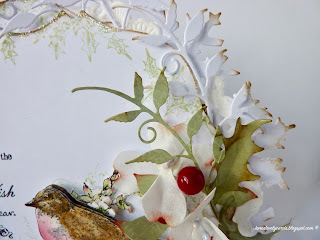 I have also used a holly stamp from the Vintage Holly set around the edges of the card. 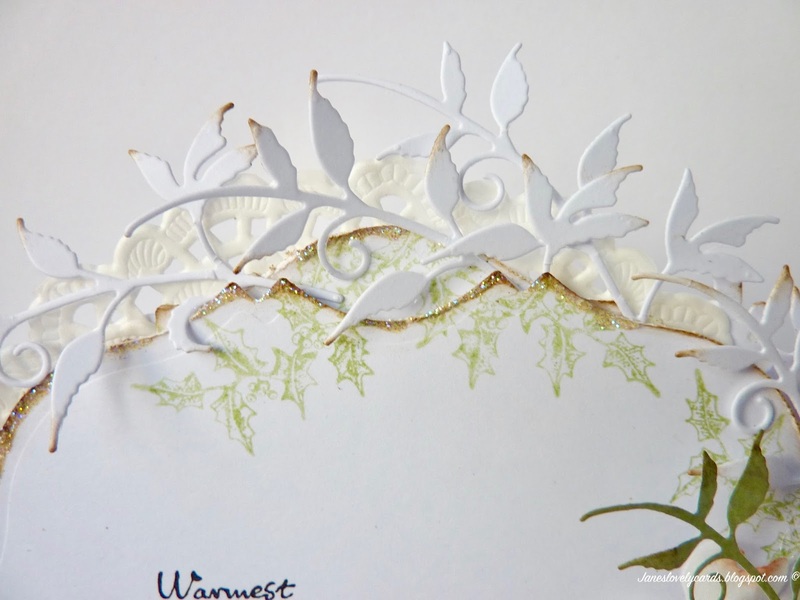 I have used Bundled Sage Distress Ink for this. 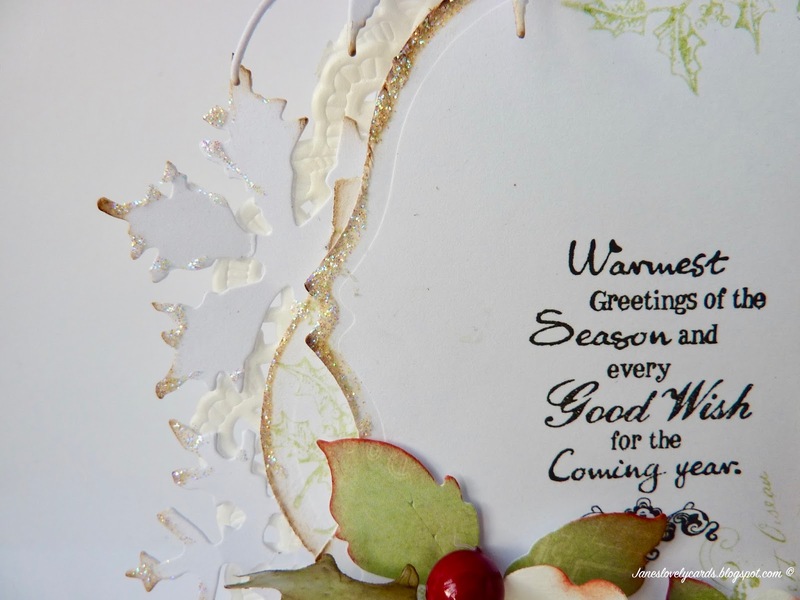 The snowflakes around the edges were cut with a Tim Holtz die. 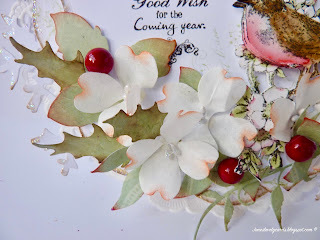 I have used a Sizzix Dogwood flower die for the flowers and another Tim Holtz die for the holly leaves. The berries are from my stash. Good morning! 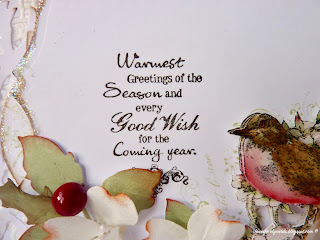 Today I would like to share another Christmas card that I have created using stamps from Stempelglede. 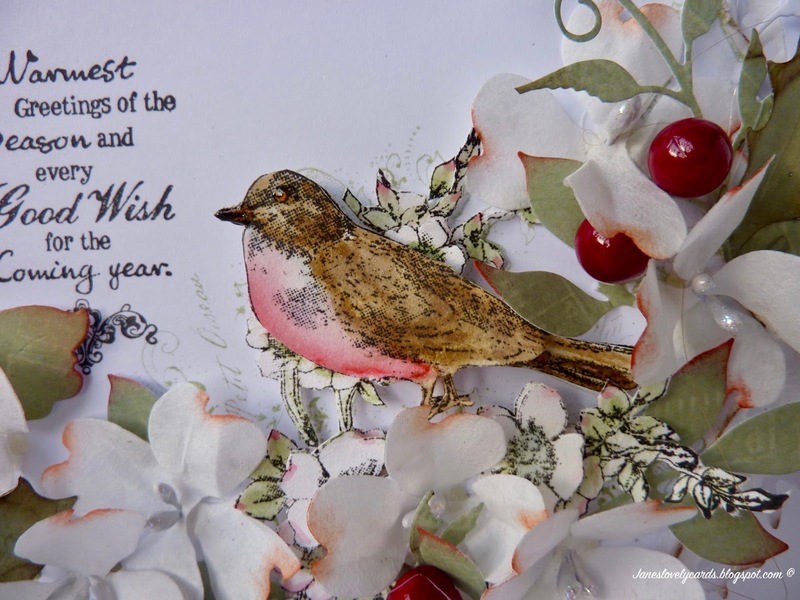 This is the second card that I have made this year using the gorgeous robin from the Vintage Garden set - I will show you the other one once I know the recipient has it! This is the card I made for my parents this year. My parents love birds and watching them in their garden and after seeing several Christmas cards in the shops with bird houses on them I was inspired to make this one! I cut out the bird house shape by hand from the designer paper. I then cut it into strips and inked the edges of the strips before piecing it all back together again. This has given the effect of a wooden bird house. I painted the image with Distress Inks before fussy cutting. I have added Glossy Accents to the beak and eye for a realistic finish and Stardust Stickles to the centres of the flowers. The pine needles were made with a Doohickey die and the holly leaves were made with a Tim Holtz die. The berries, pine cone and flowers are from The Ribbon Girl. I have added a bow using some gorgeous vintage checked ribbon from my stash. The snowflakes under the eaves were also cut with a Doohickey die, the snow on the roof was cut free hand. The heart shape was cut out freehand by folding the paper in half and cutting half of the heart before opening back out. I have then backed it with black cardstock to give the illusion of the hole for the robin to get in his house! I dag viser jeg et kort som er laget til en venn .Jeg har brukt tekststempel fra stempleplaten som heter En liten hilsen /Just a note og poststemplet er fra stempelplaten Vintage garden. Jeg har brukt ark fra Maja design. Hi all wonderful Stempelglede fans! I went to a birthday party last weekend, and can you belive...?? The lady of honor became 95 years old. And she is still living in her own house. I wanted to make her a nice card, and here it is. I have tried to paint the image in the same colours as in the papers. The image is from Stempelglede and the collection Vintage garden. I have coloured it with Distress Ink, re-inkers. For the red colour I have used Fired Brick, Aged Mahogany and Black Soot. I have also added Crackle Accents on some of the flowers. The small flowers are punched out from a Retro flower punch, small. I have inked the edges with Distress pad, Walnut Stain. and added Stickles, Star Dust. In the middel I have added Licquid pearls. 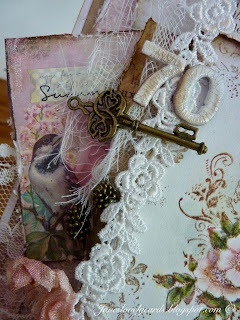 The numbers are cut out from a Sizzix die, and I have added Fran-tage, Shabby White. I have also added Fran-tage around the image, on the edges. 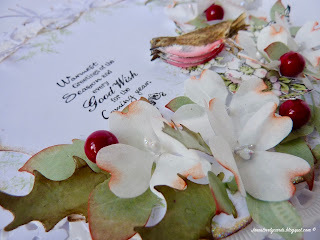 Some birtday tags and the tassels made with Magnolia DooHickey dies (vol 5). I have put some Sisal grass behind the flowers. 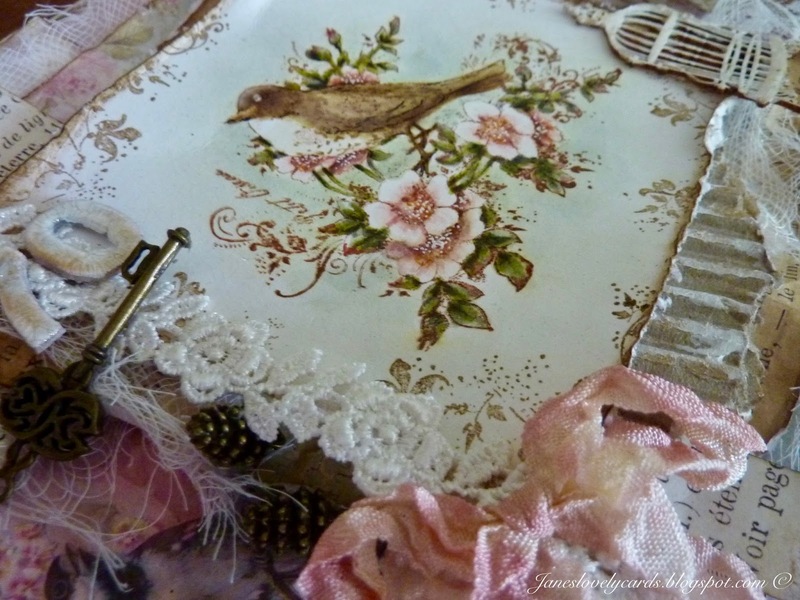 Thank you so much for visiting the Stempelglede blog! 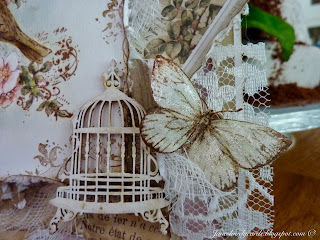 For inspiration I have used the Mood Board at Maja Design for August. 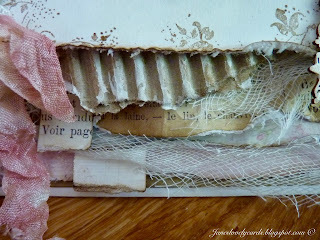 I have used the gorgeous papers from the Summertime collection. I think they fit the image perfect! Numbers are cut out with a Sizzix die. The tags are cut out from a Magnolia die; both the floral ones and the heart tags on top of the card. The shape of the card is made with a GoKreate die. The oval dies used are from Spellbinders. The texts are from the stamp collection: En liten hilsen (Stempelglede). Doilies and laces are from LLC. 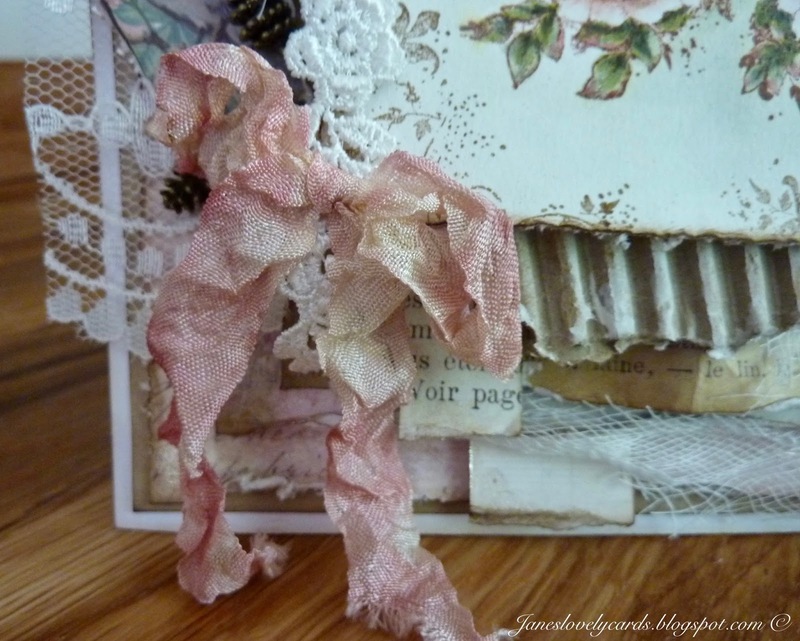 Thank you so much for visiting the Stempelglede DT blog!